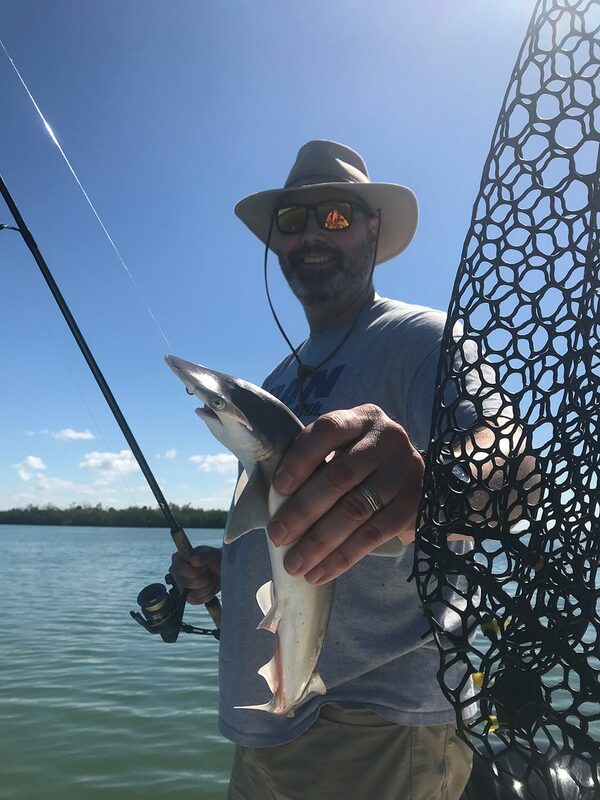 All good when it comes to catching fish during the summer months, along the Gulf Coast of SW Florida. Many fond memories have been made this year. 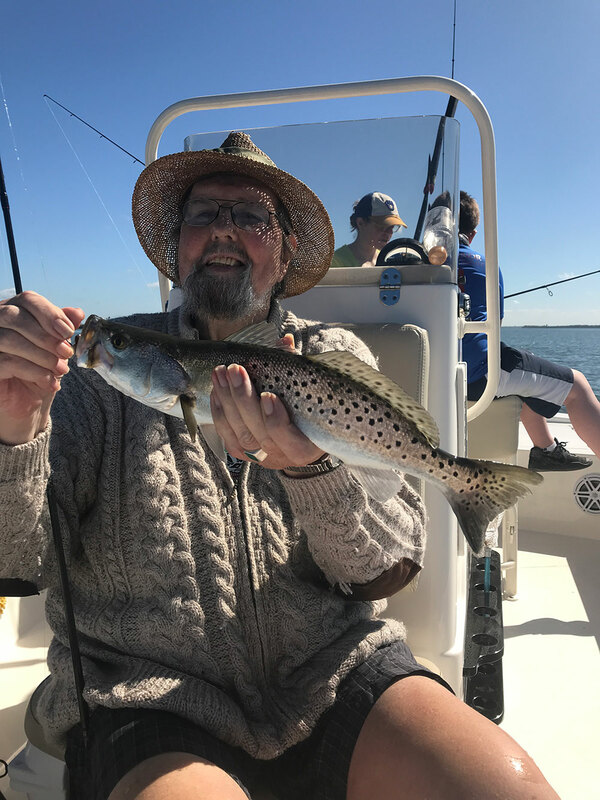 Earlier in the season I had lots of success while fishing with one of my favorite family clients, Dr. Tom O’Connor for whom I write of frequently. 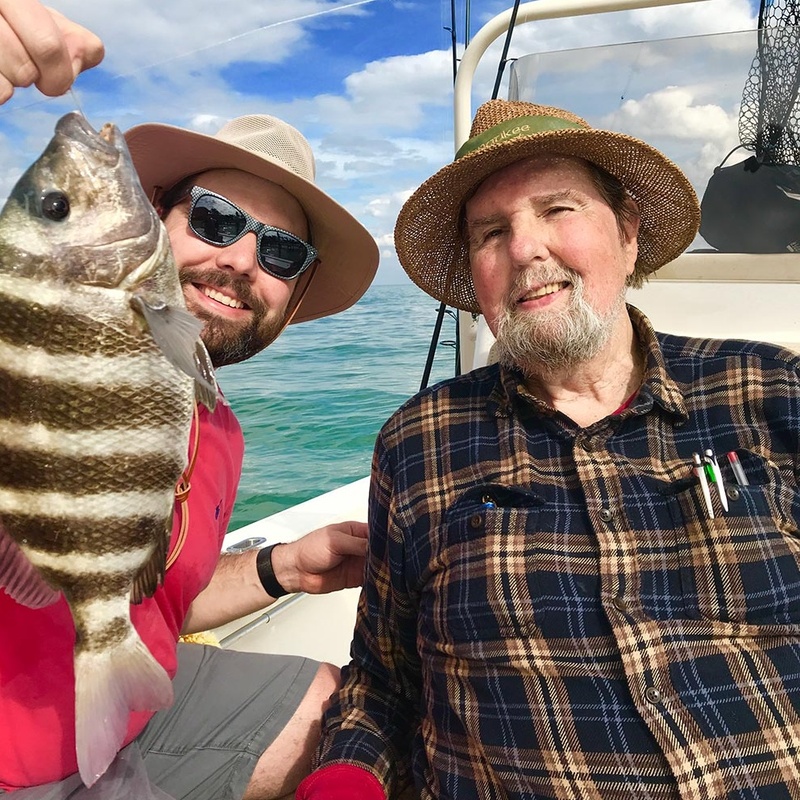 This time Tom is pictured with another of his three sons, William O’Connor, holding a Sheepshead he landed during a short visit to Bokeelia, Florida. 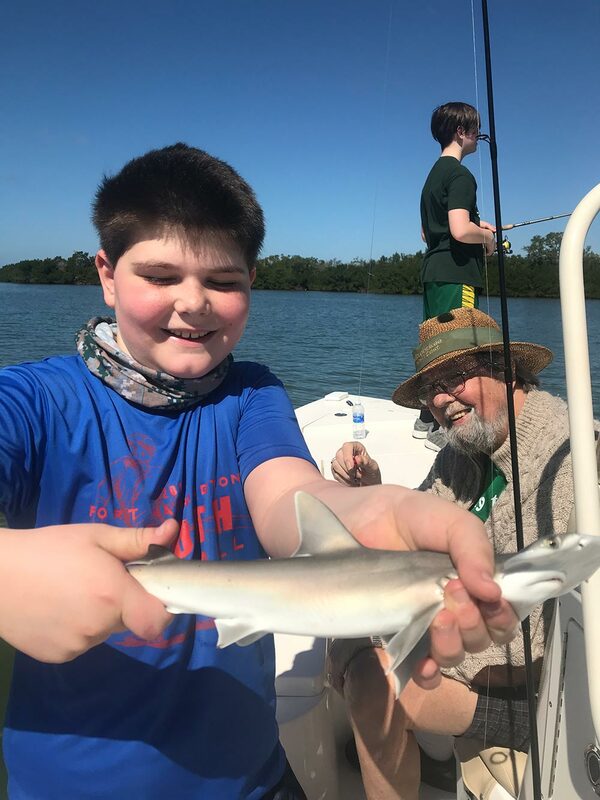 Another O’Connor family outing this year included son Dan, his lovely wife Christina and son’s Flint (14) and Quinn (11) of Mequon, Wisconsin. 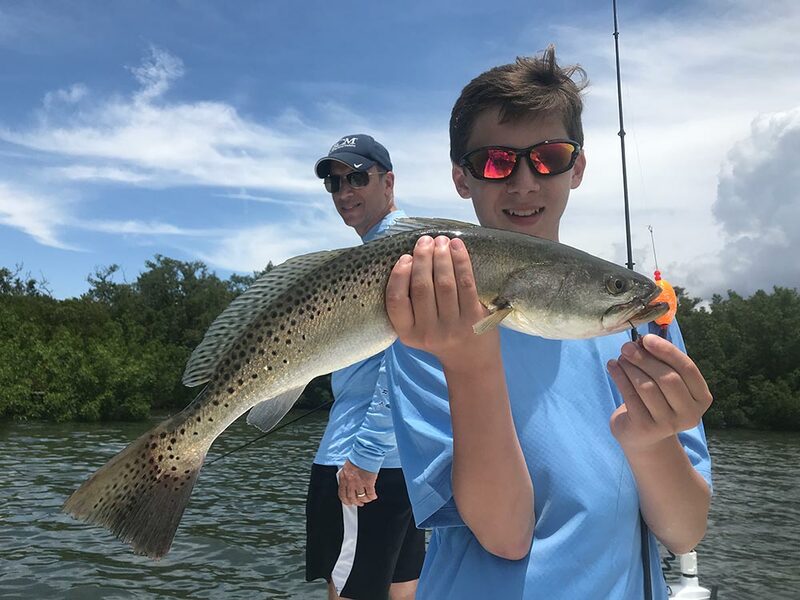 This fishing expedition proved to be especially productive when we hit the jackpot, catching over two hundred fish in the Boca Grande and Pineland locations. Approximately one hundred of them were estuary Black Tip and Bonnet Head Sharks. That day was action packed. 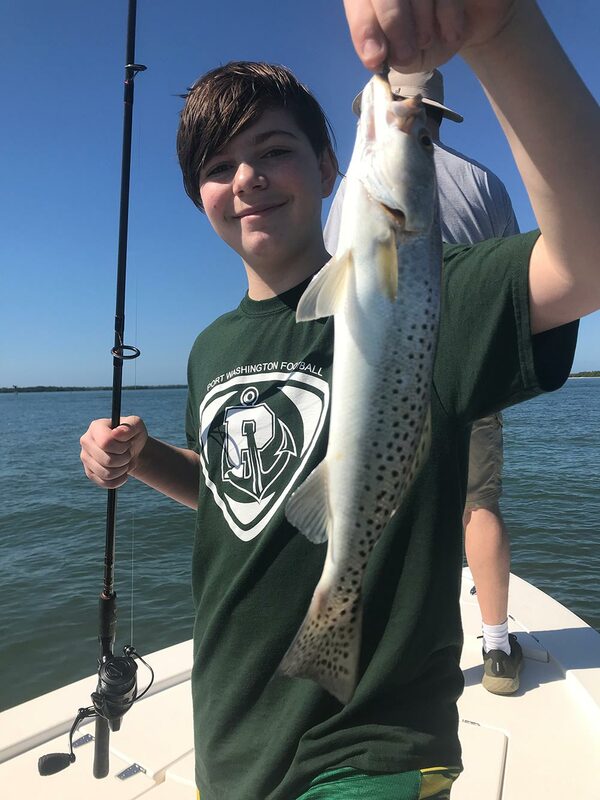 Flint is pictured with a nice Seatrout. 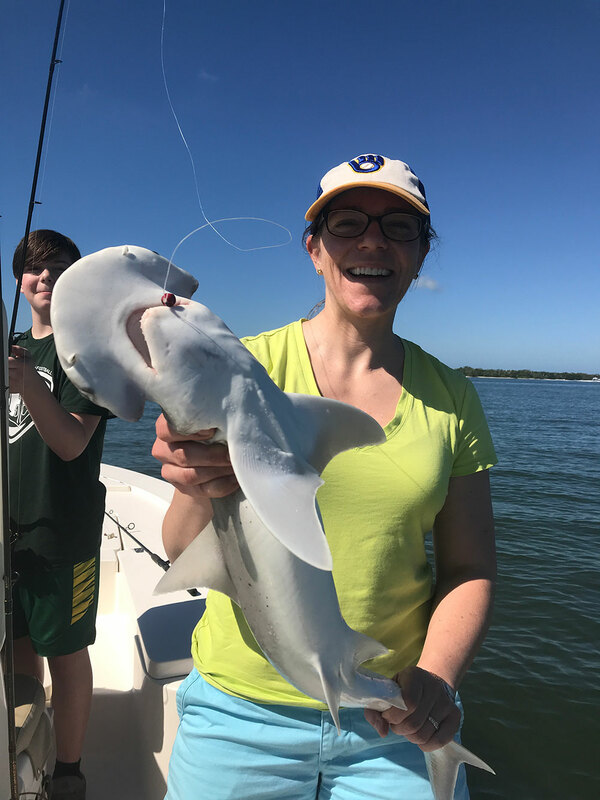 Quinn, Christina and Dan are each pictured holding one of the many sharks they landed. Tom is holding a nice Seatrout. This was a ball buster charter and we all had a blast with dad, mom and grandfather, Tom. We finished the day enjoying cheeseburgers in paradise at Cabbage Key. Quinn had so much fun that he left his travel rod and reel for me to store until he returns next season. Looking forward to it Quinn! In May, my friend Jim Ross and I took his son-in-law, Dr. Gregg Vagner and grandson Matthew Vagner(13) of Austin, Texas on our annual run. Like the O’Connor family, these people have a special place in my heart. This year we targeted Snook, Trout, Redfish, Tarpon and shark over a two-day weekend. We hooked a 120 lb. Tarpon but unfortunately lost it around some crab buoys just off the beach at Cayo Costa. Nonetheless, the experience was exhilarating for the short time it was on. We hunted the shark and Tarpon in the mornings and Redfish, Snook and Seatrout in the afternoons on the high tide. 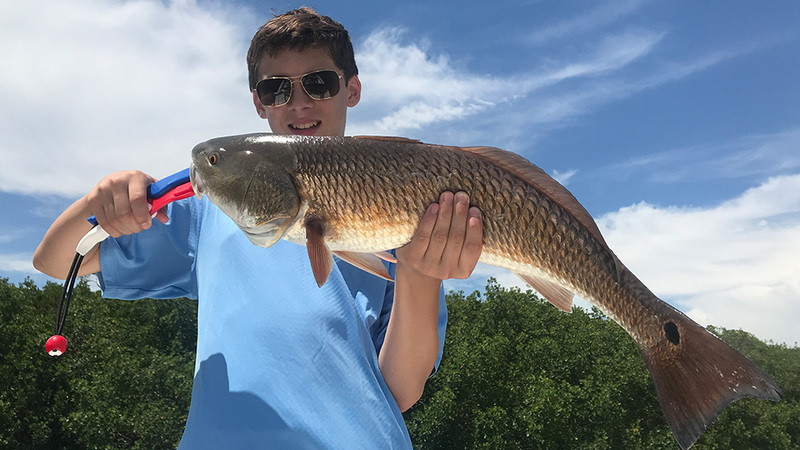 Pictured is Gregg with his first Redfish measuring in at 24 inches. 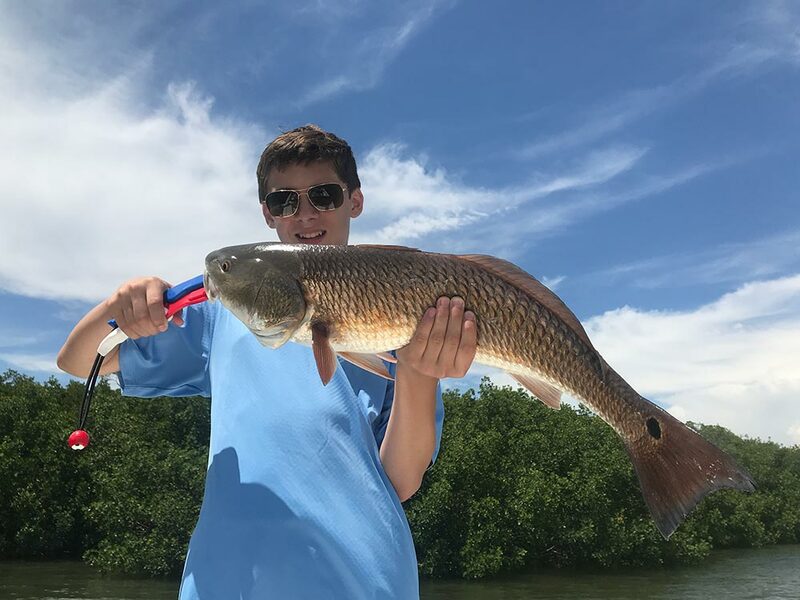 My junior angler Matthew, is pictured with his 29inch Redfish that was too big to keep. Matt cemented his angling skills when he landed one of the largest Seatrout’s of the season. Good job Gregg and Matthew! See you next year. Summer fishing both offshore and inshore is usually good. My clients are catching lots of Spanish Mackerel, Kingfish and Permit offshore. Look for schools of baitfish on the surface when targeting reefs. Catch Spanish Mackerel, Seatrout, Jack Crevalle, Ladyfish, Snook and Redfish inshore. Remember, when fishing inshore, fish moving water on outgoing or incoming tides. Fish move and eat mostly when the currents are active. Stay out of the strong afternoon storms. They can be very dangerous. This is Captain Terry Fisher of Fish Face Charters, wishing everyone tight lines! 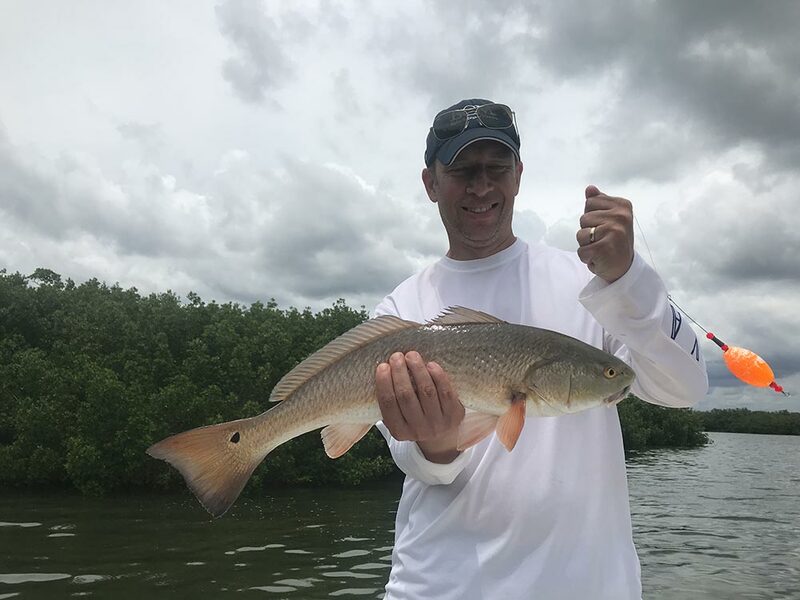 Call me with any questions regarding a charter of my vessel or as ‘Captain for Hire’ by the hour on your vessel at 239-357-6829 or email fishfacecharters@yahoo.com. Either way, I will show you how to navigate, where and how to catch fish, on your boat or mine. Check out the website www.fishfacecharters.com for more information. Go Boating Florida is supported by The Southwest Florida Marine Industries Association and the Tampa Bay Marine Industries Association, consisting of member businesses and Marine Industry Advocates on Florida’s west coast. Visit swfmia.com for more information. Are You Fueling up Correctly?